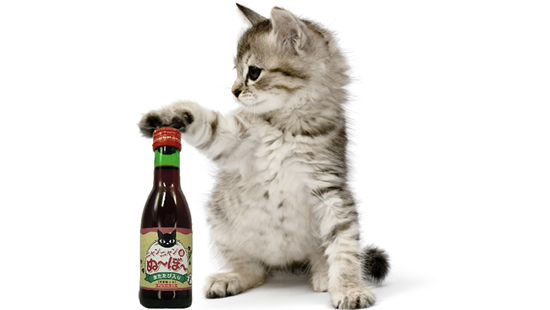 Today in Japan, bottled wine created especially for cats goes on sale. This is not a joke. Apparently. Pet supplement company B&H Lifes is rolling out “wine exclusively for cats” that is called “Nyan Nyan Nouveau.” In Japanese, “nyan nyan” (ニャンニャン) can refer to a cat’s meow as well as people screwing. Here, it refers to cats. “Nouveau” appears to evoke Beaujolais Nouveau, which is quite popular in Japan. And no, Nyan Nyan Nouveau doesn’t have any alcohol in it—much like Japanese “kid’s beer” doesn’t contain any actual booze. As noted on Sankei Biz, the drink does contain juice made from Cabernet grapes, Vitamin C as well as catnip for a beverage that supposedly tastes like red wine.